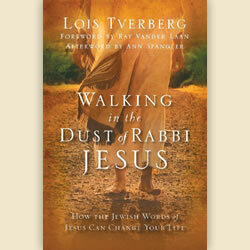 "Walking in the Dust of Rabbi Jesus"
In Walking in the Dust of Rabbi Jesus, the follow-up to her best-selling book Sitting at the Feet of Rabbi Jesus (co-written with Ann Spangler), Lois Tverberg continues to explore the Jewish roots of Christianity. The granddaughter of missionaries, Tverberg was raised with plenty of Sunday school knowledge, but later developed a deep interest in studying the Bible through the lens of the ancient world. With the rigor of a scientist, the drama of a storyteller and the passion of a disciple, she creates a vivid picture of the Jewish Jesus in early first-century Israel, yielding remarkable insights into His life and teachings. Among other topics, she explains how understanding Jewish idioms can help us better grasp what Jesus was saying, how viewing Him within the context of Middle Eastern culture can enliven His parables in surprising ways and how enriching our understanding of Jesus’ teachings can bring new depth to our walk as disciples.